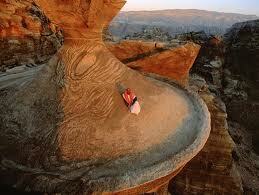 The Tafila Governorate in Jordan’s south, and around 180 kilometer’s from Amman, is a heavenly dream world. Here tourists can enjoy a variety of packages starting from the cultural-historical, to the therapeutic in its mineral waters and extensive nature reserve. The NEWCIMED (New Cities of the Mediterranean Basin) Project seeks to revitalize the touristic potential of the governorate and making it part-and-parcel of the Jordan travel experience. Presently these tourism products center around such places as Petra, Wadi Rum, Aqaba, Madaba, Jarash, Umm Qais and Ajloun. Working through its Jordan team in the Department of Antiquities, NEWCIMED seeks to make Tafila and its places more marketable for tourists. The team has been busy in charting out the touristic and archaeological places by paying weekly field visits to different sites in the Tafila governorate. In this they were accompanied by members of the Tourism and Archaeological Directorates in Tafila which is itself part of the emerging new cities in that part of Jordan. The team visited different sites which indeed showed the prospects of the governorate’s potential. The first was to the Afra mineral springs, 26 kilometers to the north of the city of Tafila. Team members lead by NEWCIMED coordinator Jihad Haroun visited water springs that came down from the mountains to settle in pools of water down the Afra Valley. All in all, Afra has 15 mineral springs out of a total of 360 in the Tafila governorate including the Al Barbayta mineral water springs which is seven kilometers from Afra. In Afra there is a visitor’s center as well as medical clinics for those who come here for the therapeutic richness of the waters and which have major healing effects for different types of chronic diseases. The waters have existed since time-immemorial and it major cultural and historical values connected to it, for it is here the first Islamic convert outside the Arabian Peninsula named Farwa bin Amr Al Juthami was crucified. He was a leader during the Roman-Byzantine period that ruled this part of the world. Afra is just one tourist attraction, mainly enjoyed by locals and other Jordanians from other parts of the Kingdom. But its potential for Arab and international tourists is seen as great. Tafila city was the center-point of these visits, and its local officials who showed the Jordan team from Amman around. The city is becoming increasingly urbanized with its growing population and somewhat diversified economy of mainly agriculture holdings, some small-scale industry, one or two large scale firms producing phosphate, and archaeological and tourism sites. All these make the city and the governorate ideal as a case study in new cities, and one of the objectives of NEWCIMED. In the city itself lies the ruins of the Tafila Castle where the Edomites once lived in the Iron Age. The castle was subject to many earthquakes but today stands renovated and a structure that represents a bygone age and a model of tourist attraction. Like many in the past it stands on steep sloped and was used for defense purposes and it has unique tunnels that lead to springs which goes back to Edomite architecture. The whole governorate has historical towns and villages that go back to the Edomites, the Nabateans and Roman and Islamic periods, some of these like Khirbat Ghrandal, Al Rashadiyyah and Khirbat Al Tannur. One of their visits the NEWCIMED Jordan team visited Khirbat Al Thareeh, 16 kilometers north of Tafila city, to see the remains of the Nabatean temples, its arches, columns, hot baths and stone channels for water. However, in Al Sila’ and Al Ma’tan the team saw showcases of what the Ministry of Tourism/ Department of Antiquities are trying to do by way of preserving the sites and in promoting their tourism promise. In Al Sila’, 13 kilometers from Tafila, a visitor’s center had been renovated in 2002 and has plush historical surroundings as 18 heritage houses were renovated as overnight stays for tourists to enjoy. The renovation was made as the villagers left the site and moved to the surrounding areas. The village site goes back to the first millennium and played a great role in the different civilizations that ruled the area from the Babylon period and Nebuchadnezar, the Edomites, the Romans and Nabateans. Exactly in front of the visitor’s center is a huge rock mountain that the team was told is the Sila’ Castle. Over the centuries it has been enveloped by rock formations and much excavation is required to reveal its structures built by the Edomites. Evidence show that it has a narrow stairway carved into the rocks, cisterns for water storage as well as several caves to store food. Al Ma’atan, a short drive away from Al Sila’, is also a 300-year-old village, opposite Busayra, the ancient Edomite capital, facing the Dana Nature Reserve. The site however, going back to Nabatean times, was used as a trading post. Today several historical and archaeological sites have been found including Qaser Ramsis, the Egyptian pharaoh. Walking trails are being built here starting from Al Sila’, passing through Al Ma’tan and going all the way to Dana with its magnificent scenery. Dana, an internationally-known wild nature reserve is simply captivating as your vehicle inches downwards a long a small track of a road into the village. The small houses used be occupied by the villagers who like the other sites had moved away. These have now been turned into guest houses. The little path ends up into the guest house that is run by the Royal Society for the Conservation of Nature which looks after the reserve. Its balconies look beyond a magnificent mountain that stretches into a series of rolling elevations. Down under starts the track into wildlife. Tourists and visitors start from here. They begin their tracks, maneuvered by tour guides and start to explore the nature of the reserve which is over 300 square kilometers of wildlife including 697 plant species, 190 different kinds of birds as well 282 rare kinds of animals including the Grey Wolf, Nubian Ibex and lesser kestrel. Up to 50,000 international visitors and local visitors come here every year. When the reserve was established in the early 1990s, it received no more than few hundred every year. Small hotels scattered around the village for those who want to stay overnight. Other accommodation however, is provided in 26 camps in the middle of the reserve. Because of its extensiveness with its highest elevation reaching 1500 metres above sea level, the woodlands exist in bio-geographical zones and rich biodiversity. The woods, which has extensive number of archaeological sites, also led to Wadi Finan and its extensive lodge which is candle-lit rather than electricity-driven as a contribution to protecting the environment. The NEWCIMED Jordan team made these visits as part of surveying the area of Tafila to identify different points of development that can be nurtured and sustain its cultural heritage. Marwan Asmar handles media communication as part of the Jordan team in the NEWCIMED Project supported by the European Union under its European Neighborhood Partnership and Cross-Border Cooperation. © Hackwriters 1999-2018 all rights reserved - all comments are the individual writer's own responsibility - no liability accepted by hackwriters.com or affiliates.